AFC Littlehampton Ladies’ superb unbeaten run came to an abrupt end against a well-organised Lancing Ladies, bringing them back down to earth with quite a bump. Although Littlehampton came out of the blocks absolutely flying and dominated periods of the first half, chances were extremely limited and they went down 2-0. Impressive striker Emma Chrimes came close on ten minutes following a lovely passing move down the left through Katie Burling and Steph Carter. If it wasn’t for a superb near post save by the Lancing keeper, Littlehampton would have taken an early deserved lead. 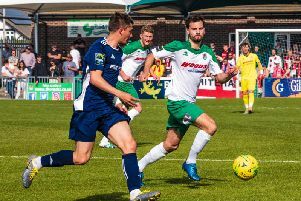 The game will be remembered for very few opportunities with most battles being had in the midfield which, to be fair, was just edged by Lancing. In a match of very few chances from both sides, it was Golds who were unable to convert their opportunities. For Littlehampton to find themselves 2-0 down at the break certainly flattered the visitors as goals were conceded through errors. The second half was a different story, with a change of formation and the introduction of Katie Fisher and Mel Miller, who certainly whipped the lacklustre Littlehampton into shape. With the wind behind them the Golds were getting close, however, more heroics from the Lancing goalkeeper denied the home team with a opportunity for a foothold in the game. As the match progressed you could see that Lancing had become very defensive and were soaking up everything that Golds could throw at them. Although somewhat pleasing was the fact that Littlehampton kept a clean sheet in the second half. The top-of-the-table clash certainly wasn’t the spectacle that supporters and reporters were expecting and will probably be remembered for the strong defence. A special mention, however, must go to Fisher who was quite rightly awarded player of the match.